March 30, 2019 Bill Wagner - The Capital, Annapolis, Md. Navy football lost one of its legends Thursday when Joe Bellino died in his home state of Massachusetts at the age of 81. 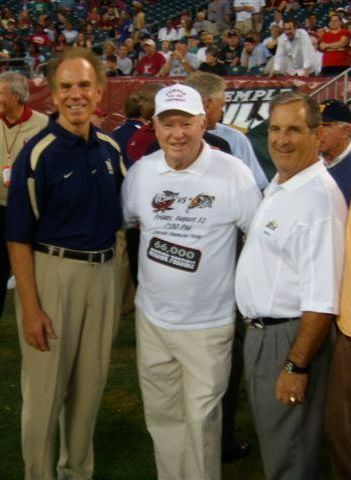 Bellino, the 1960 Heisman Trophy winner as a standout halfback for the Midshipmen, had been in failing health for some time. He starred at Navy from 1958-1960 under head coach Wayne Hardin, rushing for 1,664 yards on 330 carries and scoring 31 touchdowns during his three-year career. The 5-foot-9, 185-pound speedster was also a dangerous return man and amassed 577 yards on kickoffs and 256 yards on punts. Bellino was limited to just four years on eight carries in the Orange Bowl, but scored Navy’s second touchdown off a spectacular catch of a pass from Hal Spooner — performing a somersault out of the end zone. A unanimous All-America selection, he was awarded the Heisman Trophy and Maxwell Trophy in 1960. It was an era when football players went both ways and Bellino was also an outstanding defensive back, recording an end zone interception to preserve Navy’s narrow victory over Army that year. Also a standout baseball player, earning three letters as a catcher and outfielder at Navy. In 1959, he batted .428 and led the Eastern Intercollegiate League in stolen bases. He posted a .320 average in 1960 and served as team captain as a senior in 1961. He capped his senior year by winning Navy’s top two athletic awards – the Thompson Trophy and the Naval Academy Athletic Association Sword, marking the first time in 41 years that one midshipman received both honors. He spent four decades working in the auto leasing and auction industry and was a longtime member of the Board of Directors for Northern Bank and Trust, based in Woburn, Mass. Bellino’s son John is a 1989 graduate of the Naval Academy while his daughter Therese is a public school teacher in Cambridge, Massachusetts.